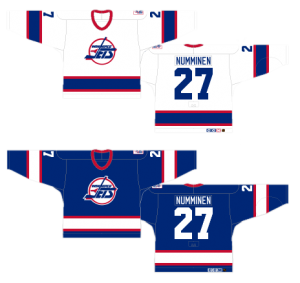 This installment of the Worst to First Jerseys features the Winnipeg Jets, and part of this series is hosting posts on a blog of the team that’s being featured. This post was originally featured on the blog Jets Nation, which can be found by clicking here. And much thanks to Jets Nation for letting me guest-post. The big question for the Jets is which jerseys should be included? Did I ignore the jerseys of the Jets incarnation that moved to Phoenix to become the Coyotes? 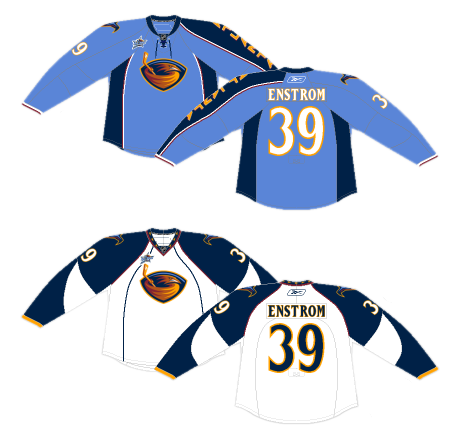 Or, do I include the jerseys of the Atlanta Thrashers, the same organization that now resides in Winnipeg? Or, do I decide to get really lazy, ignore both and make this the easiest post to write ever, with only their current jersey? 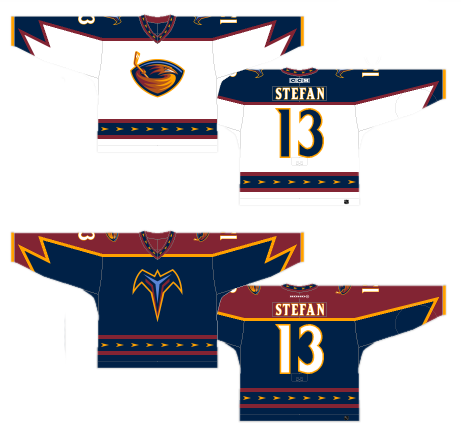 Or do I throw everything into the mix since I’ll never get the chance to tear apart some awful Thrashers jerseys? Sure, why not. Winnipeg fans, be glad that the Jets’ ownership had the good sense to ditch the Thrashers name and brand when they brought the team up from Georgia. Otherwise, you could be watching your team playing in these jerseys. That would be a sad way to being a new era of hockey in Winnipeg. Very sad. Sadder than this kitten. The hardest thing in ranking the Thashers’ jerseys on this list is which should be the worst. Seriously, these jerseys are something awful. I’m all for trying out new things, but there’s more gaffes here then the entire a group of Republican nomination candidates, amirite? Yeah I know, that was months ago now, but it was low-hanging fruit. First off, their actual logo is nowhere on the jersey. They have some modified alternative logo as shoulder patches, but that’s it. Granted, with a third jersey you can play around a little bit perhaps, but the thing that makes hockey jerseys great and unique compared to all the other major sports is the dominant placement of the logo. Football? Nope. Basketball? Nope. Baseball? Nope. None of them even have the entire logo on there. And that’s my major complaint about these jerseys. They were designed to be non-hockey jerseys, meant to identify hockey with other sports that a non-hockey market like Atlanta likes better. Marketing 101: Don’t try to be something you’re not. Put your best foot forward and believe in what you have to sell. If the market is a good fit, whatever you’re selling will sell. 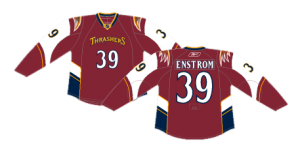 Other points, quickly, so I don’t waste too much time on this jersey: Emphasizing the first “R” in “Thrashers” on the jersey makes it look like Trashers. The oddly-shaped white blotches on the sleeves, meant to follow the form of the Edge jerseys, make no sense and follow the contours of the jersey materials for no reason other than that they’re there. The fonts on the jerseys for the nameplate and numbers are oddly constructed, with the 3 in the example above looking like it’s missing its middle arm. And for a font used on a hockey jersey, it’s (again) very non-hockey. Although I do appreciate them trying to use a more interesting font on their jerseys, this one is a complete miss. What I do like is that they tried using a more unique colour on their jersey: a maroon/burgundy colour, which is unique among the NHL teams. The rest of the piping on the jersey is okay, but again, things just stop and start seemingly in the middle of nowhere except to follow the contours of the jersey, which aren’t really noticeable anyway unless you’re looking up close. This jersey deserves a double facepalm. Can me move on now? Jersey Recommendation: How about #21 Eager. He was with the team for half a season, which is more than this jersey deserved. Plus, the guy’s a tool, and so is this jersey. Okay, it doesn’t get much better here. Again, from the bad font selection to the weird piping on the sleeves, this jersey is a bit of a mess. But, at least it actually has the team logo on it. Well, at least the home white jersey does. The road darks have some Batman-esque alternate logo on it. 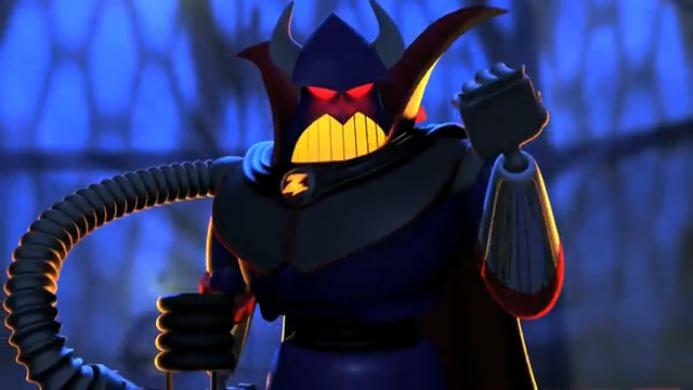 Or is it Zurg-esque? Oh, sorry, it’s a flying bird? Yeeeaaaahhhhh, sure it is. But, this isn’t about the logo, it’s about the jerseys. As mentioned earlier, they’re still using the badly constructed non-hockey font on these jerseys, but they’re made especially bad by outlining them in yellow. What that does is make the letters and numbers less defined because there’s not enough contrast between the yellow and white. The letters/numbers on the white jersey look significantly smaller than the ones on the dark blue jerseys, even though they’re exactly the same size, because the eye bleeds the yellow and white together, making it harder to read than necessary. I’m guessing the pointy design on the sleeves are meant to mimic the wings of a bird or something? Cool, except bird wings don’t look like that. If they did, brid wings would be a vicious weapon and criminalized in 30 states. Panes of glass tremble at the thought of birds flying into them. Even the Angry Birds don’t have wings this fierce…and they DESTROY ENTIRE BUILDINGS! It’s lazy design and could have been so much better. 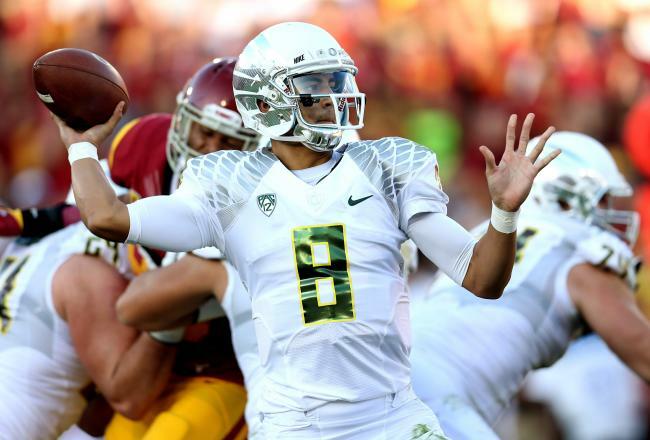 The best use of wings in a sports jersey goes to the Oregon Ducks. Take notes Anaheim. I’ve never been a fan of patterned piping along the bottom of the jersey, and this jersey doesn’t do anything to alleviate that, especially since they put it again on the collar. Simple stripes are completely sufficient. In design, simplicity should always take precedence over needless complexity. 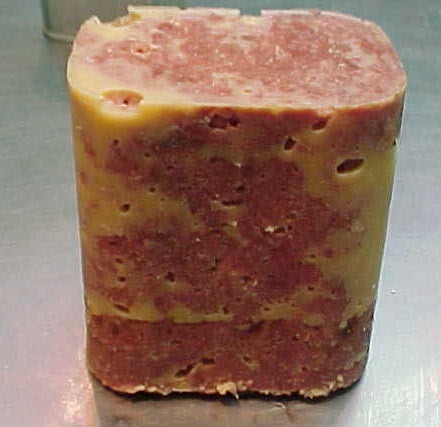 And that’s my core beef (not to be mistaken for corned beef) with this jersey: it’s overly complex, over-designed and just has too much stuff going on. It’s a mess. Jersey Recommendation: #27 Stefan. The first ever draft pick made by the Thrashers turned out to be a bust. 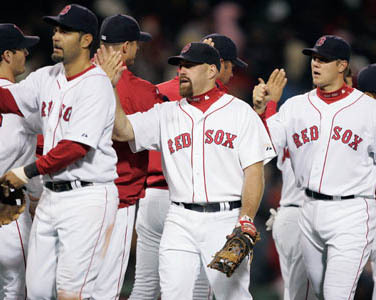 Like these jerseys. Get it in the road blues, just to be extra awful. The biggest redeeming value of these jerseys is the blue home jerseys, which is pulled from the very small blue highlight above the bird on their logo. What makes it great is the same (and only) positive from the 6th ranked jerseys on this list. It was (at the time) unique among the league and actually works really well on a jersey, as the Penguins have subsequently proven. The baby blue colour also looks great on a sheet of white ice and is basically the only innovation that the Thrashers tried on their jerseys that worked. Speaking of innovations that worked, here’s one that didn’t: asymmetry. For the life of me, I don’t understand why they decided to have a dark blue band run down only the left sleeve, with “Atlanta” running down it. I can see how it’s an interesting departure from almost every single sports jersey ever created, but there are logistical aspects to how jerseys are made. I wonder how many referees asked the players to turn around to see which number they were when calling penalties. Or how angry the manufacturers were, as it basically creates more work for them to create two distinct sleeves for every jersey instead of just two the same. And it throws the whole jersey off-kilter (as asymmterical things tend to do), giving more visual weight to one side of the jersey, with nothing to counter-balance it. Asymmetry can work great in many aspects of design, but here, it’s clunky and slapped together without much thought. 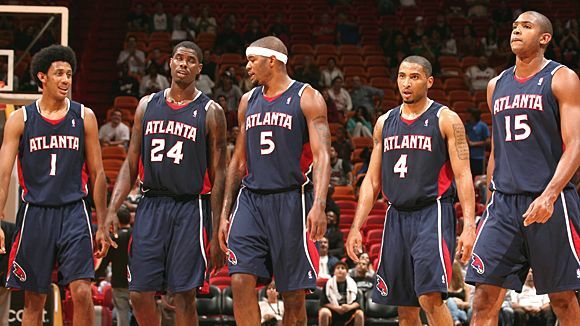 Atlanta just could never get their sleeves right. From the asymmetrical home blues to the oddly pointed additions to the road whites, each jersey was a failure on the sleeves. The pointed white pattern on the road whites, like their third jerseys in 6th place, just seems to come and go out of nowhere, for no particular reason. This time, it doesn’t even follow the contours of the jersey materials. But at least these jerseys toned down the over-complexity of their other jerseys, with the patterns/stripes made simpler or removed altogether (except for the pattern on the road whites’ collar). 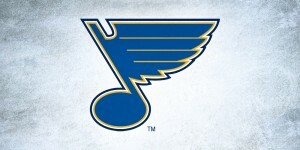 And I like the inclusion of the laces on the collar of the home blues. It still uses the same strange font, with the yellow outlined text, but this is pretty easily the best jersey that Atlanta came up with. And it’s still worse than every single Jets jersey ever worn. Jersey Recommendation: #17 Kovalchuk. Why not? He’s a good player and was the face of Atlanta for a long time. Despite the asymmetry, get it in the home blues. Finally, we’re getting into actual Jets jerseys! 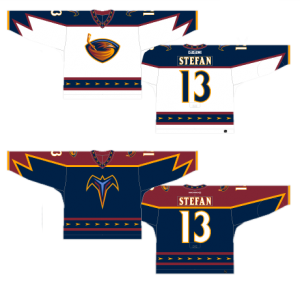 And after going through all the Thrashers’ jerseys, these are the model of classic hockey jersey aesthetics. Like the majority of hockey jerseys (especially at the time these were worn), they’re either blue or red. The lines are simple and bold. The logo is prominently displayed and, because of the simplicity of the jersey, is the obvious focal-point of the jersey. 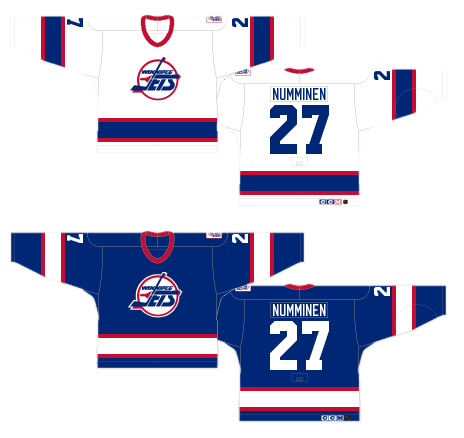 And it’s the worst jersey a team named the Winnipeg Jets has ever worn. That’s a harsh statement, but consider it more a positive indication of the approach that the Jets have taken to jersey design throughout their existence than calling-out one specific jersey. But, what makes this jersey drop to the bottom, compared to the Jets’ other jerseys, is that it looks dated. And the main reason it looks dated is because of the piping/striping on the jersey. The simple, straight red and blue lines (or red and white on the blue jerseys) are an aesthetic born from the late ’70s and ’80s, and the solid two-stripe is not something you regularly see in hockey at all. 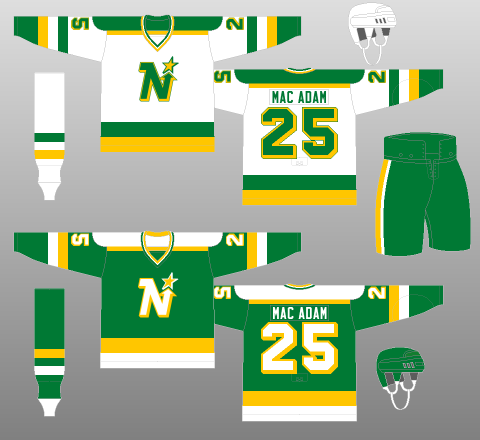 The North Stars did it for a while, but very few others. 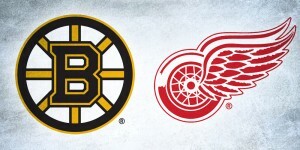 Other teams either have one solid stripe (like the Red Wings, for example), or the 3+ stripes (like the Bruins, for example). I’m not against that aesthetic, but there’s no question it dates the jersey. The solid band of striping, from cuff to cuff and over the shoulders, is also a somewhat strange look, not regularly used either. Only Colorado, Philadelphia and, well, the Jets use that style today, and in all those cases, it’s not a solid line but has some curves to it. The only other jerseys to have had this particular feature that I could find is the Maple Leafs from 1970 to 1992, and the NHL itself, in various All-Star jerseys. It only helps make the jersey look more dated yet. But otherwise, there’s little to complain about. The jerseys are solid and simple. The blue is a perfect shade of blue (not too dark to almost be considered black, which I’ll talk more about later). The red works as an accent and the font/type are your basic hockey standards. Like the Jets at that time, and unlike Lady Gaga, it was nothing flashy but it got the job done. 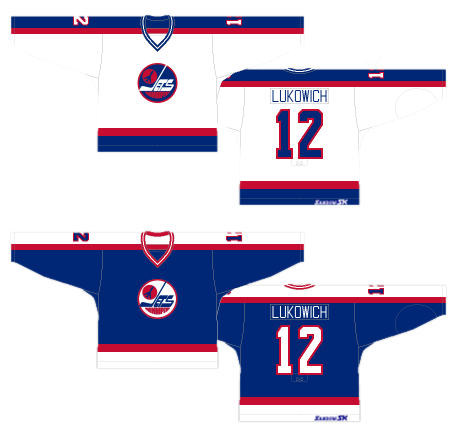 Jersey Recommendation: #10 Hawerchuk. Was there any doubt? The undisputed leader of the Jets during this time. Get it in the home whites, a classic symbol of the playoff whiteouts in Winnipeg. The Jets’ current jerseys are decidedly less-dated than the previous jerseys, but if after only one year of being in existence they already looked dated, this wouldn’t be the second best jersey the Jets have ever worn. But this jersey isn’t without its issues, one of which I’ve alluded to already. The Jets are by no means the only culprits, but when the blue of a jersey is so dark that it borders on being black, commonly called “midnight blue”, it’s just too dark. When you’re outside after dark, and you look up at the sky, would you say that the sky is black? Probably. But it’s not, it’s actually a very dark blue, but it’s hard to differentiate between a very dark midnight blue and black sometimes. And these home jerseys are like that. 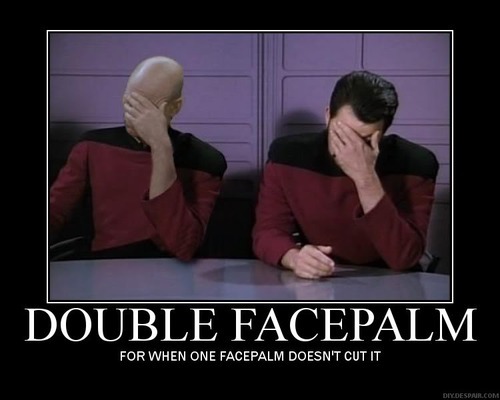 It bugs me because if you’re going to have a blue jersey, just have a blue jersey – not an almost black jersey. 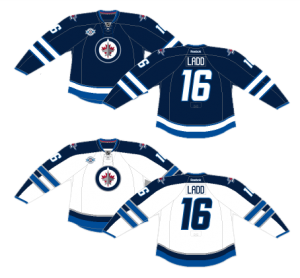 The other Jets’ jerseys are almost the perfect blue – one that’s dark but still obviously a blue colour. So, that begs the question, what do I have against black (or almost-black) jerseys? Hockey is a sport that’s played on a blank canvas – a clean sheet of white ice – and putting splashes of colour onto that canvas makes for a more interesting and absorbing game to watch. A road white jersey versus a home black jersey is just not taking advantage of one of the opportunities that playing the sport of hockey gives you. Take notes Los Angeles. Aside from that, these are some solid looking jerseys. 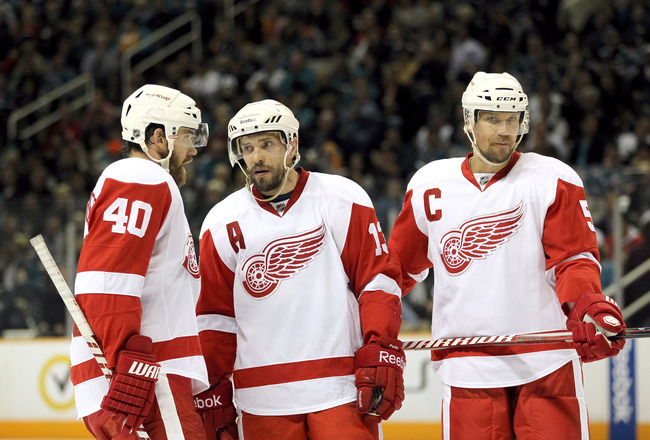 Like the preceding jerseys, it’s nothing incredibly flashy with a well-executed traditional hockey jersey aesthetic. But it’s also got some interesting contemporary elements to it. The piping along the bottom of the jersey follows the contour of the jersey line rather than just being a straight line. In this case, it works really well. The two sets of striping on the sleeves too is a slightly departure from standard hockey design aesthetics, but it works well in this case. I’m not convinced it works as well on the road white, since it’s crossing over the dark blue band on the sleeves, but that’s a small complaint. Which leads to the fact that there’s some legacy elements to this jersey. The solid band of colour running from cuff to cuff on the road whites is, to me, an obvious homage to the original Jets jersey that I’ve already discussed. 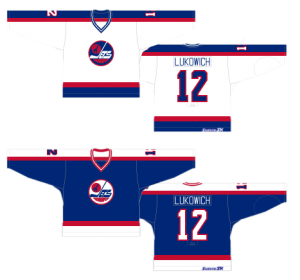 Even using the two solid stripes of colour at the bottom of the jersey, but adding in a very narrow third stripe right above it, harkens back to the original Jets jersey as well. It’s subtle elements that increase the appeal of this jersey. Using two tones of blue as the dominant colour scheme and leaving the logo (and alternative logo shoulder patches) as the only red on the jersey is great as well. It keeps the logo as having the most visual draw to the entire jersey, as it should be. 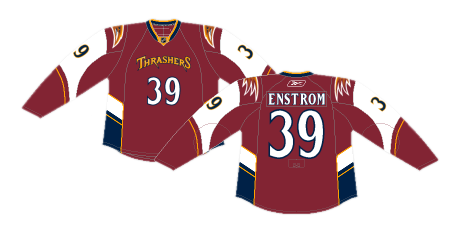 And, a new font has been used, and it’s something much better than the font the Thrashers used. It’s, overall, a solid jersey. Jersey Recommendation: I think you should get a #27 Oduya. “Oh, do ‘ya?” Well, if you want. I just wanted to make that joke, because I bet Oduya’s never heard that one before at all. 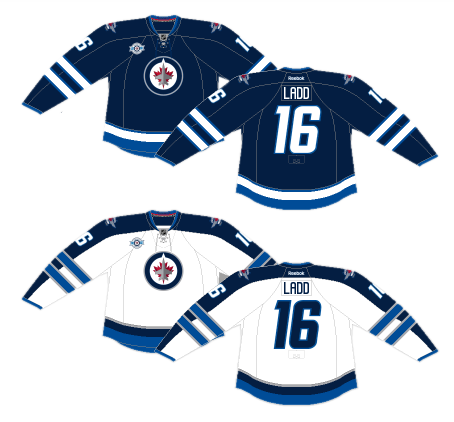 If not Oduya, how about the first captain of the new Winnipeg Jets: #16 Ladd, in the road whites. If anyone with no previous hockey knowledge were to ask me what a typically standard hockey jersey looks like, I would probably pull up this jersey. It’s just so incredibly solid and again, nothing flashy and gets the job done. It is the quintessential hockey jersey. That’s not to say it’s the best hockey jersey ever. Sorry Jets fans, but I wouldn’t put it close to the best ever. 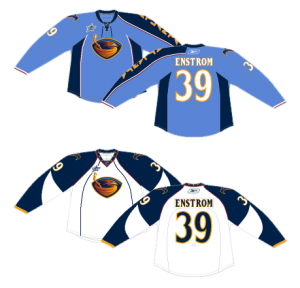 Those are the jerseys that push the envelope successfully, or have some amount of flash, or uniqueness, or element that’s specific to the team wearing it. And these Jets jerseys don’t really have anything like that. Another way of saying it is that there’s absolutely nothing to complain about with these jerseys, but there’s nothing really to get incredibly excited about. It sounds kind of like a back-handed compliment, but it’s not intended that way. It’s a solid jersey that should be worn with pride. The blue is, again, a perfect shade of blue and would never be confused with black. The piping on both the sleeves and the bottom of the jersey is consistent and solid, with a less-dated look that the original jerseys – something that’s more timeless. 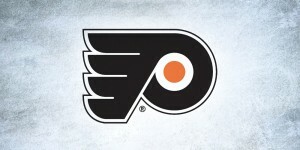 The fonts and type are given the standard hockey treatment. The amount of red compliments the amount of blue, working perfectly as an accent colour. 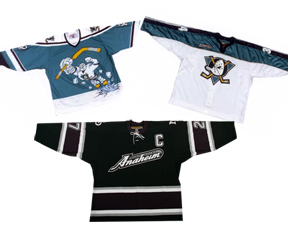 The logo is allowed the room to breathe and be the most prominent element on the jersey. It’s just a solid jersey. The saddest thing about this jersey is that, as excellent and solid as it is, for the season after this jersey was retired, it got turned into these monstrosities. 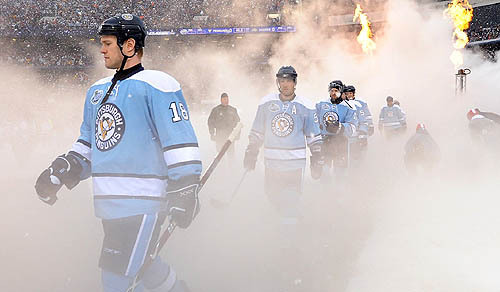 The Jets’ legacy to the world of NHL jerseys is a no-nonsense style that does the job right. That’s something to be proud of. Jersey Recommendation: #13 Selanne. No question, the best player to ever wear this specific jersey. 76 goals in his rookie season. Unbelievable. Agree? Disagree? Which Jets jersey do you own? Let us know in the comments below.